A total of 289 lots of mostly Irish art will be offered at the Morgan O’Driscoll fine art sale at the Radisson Blu Hotel in Cork on May 9. 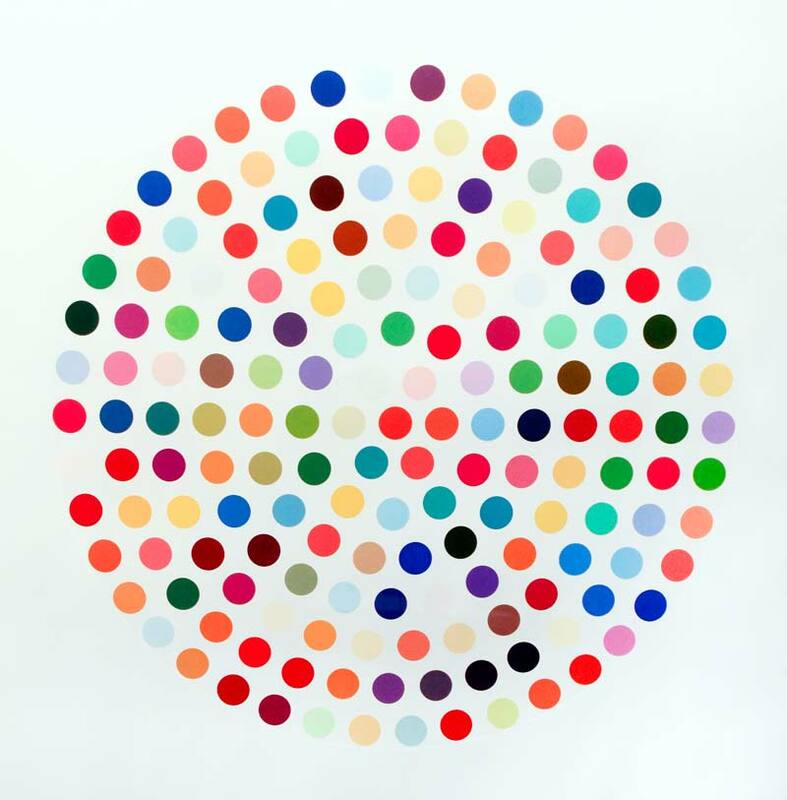 Internationally celebrated artists Damien Hirst and Andy Warhol are represented by limited edition prints. The most expensively estimated lot on offer is Gerard Dillon’s Spanish fishing village which is estimated at 20,000-25,000. There are prime works by Markey Robinson, William Conor, Maurice Wilks, William Crozier, Colin Watson, Mark O’Neill, Dan O”Neill, James Humbert Craig and Sean McSweeney. Here is a small selection. The entire catalogue is on-line. UPDATE: Around 68 per cent of lots were sold. The top lot was was William Conor’s Music Session, a work with crayon which made 13,500. THE Russian art collection of an Irish businessman who used to travel in the old Soviet Union goes on sale at Kilternan Art Gallery in Co. Dublin from April 30. The collection of 66 works includes landscapes, still lives and portaits. All were produced during the period from the 1920’s to the 1980’s, a time when artists in Soviet Russia underwent a rigorous training. The price range is from 200 to 4,500 euro. About two thirds of the work on offer is at or under 400 euro. Hosted by Brian Merry the sale continues until Sunday May 8. Opening times are from 10 a.m. to 5 p.m. every day. 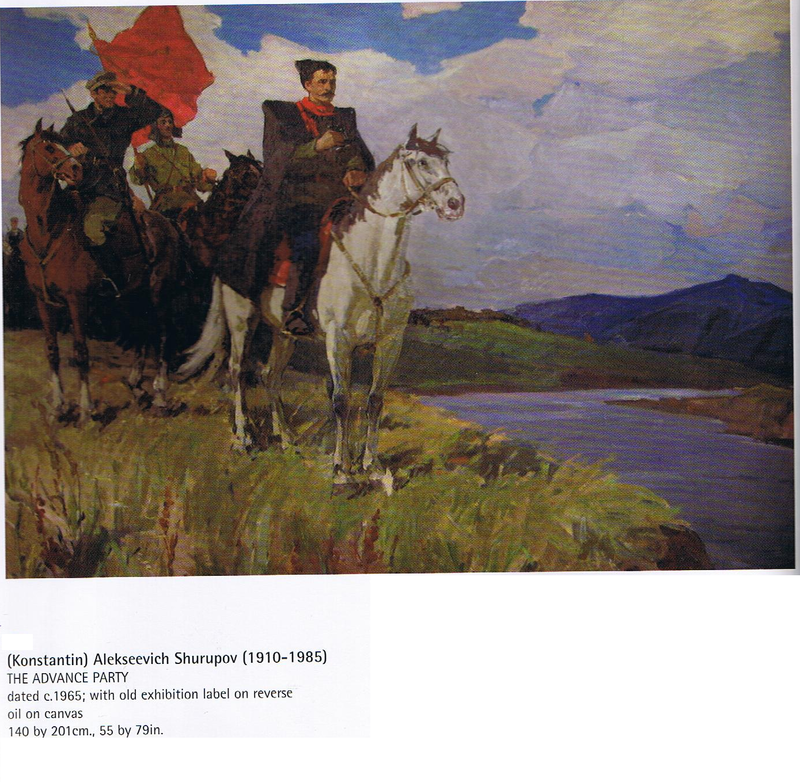 The picture on the right by Konstantin Alekseevich Shurupov (1910-1985) is titled The Advance Party. It is dated c1965 and the original gallery exhibition label is on the back. Three centuries of period furniture, fine art, garden statuary, seating and planters feature at Sheppards three day sale of outstanding interiors and exteriors on May 10, 11 and 12 at Durrow, Co. Laois. The sale on Thursday, May 12 is of 300 lots of Asian art. Photographic rarities on offer include this image by Daniel Farson of the artist Lucian Freud and the writer Brendan Behan in front of the Mansion House in Dublin. Dated August 1952 the print is signed and stamped. It is estimated at 800-1,200. The second image is of the northern quays, Dublin circa 1947. The silver gelatin print is a view from the Ha’penny Bridge extending west towards the Four Courts. It is estimated at 1,200-1,600. 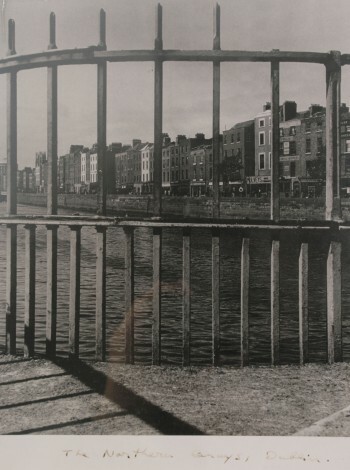 It is one of two Dublin photographs taken by Bill Brandt in Dublin on offer at Sheppards on May 10. Brandt’s work is to be found in museums like the Victoria and Albert in London, MoMA in New York and the Bibliotheque Nationale de Paris. The second image by Brandt is of the now deconsecrated St. George’s Church at Hardwicke Place designed by Francis Johnson. Johnson donated the bells of St. George’s which are heard chiming by Leopold Bloom in James Joyce’s Ulysses. 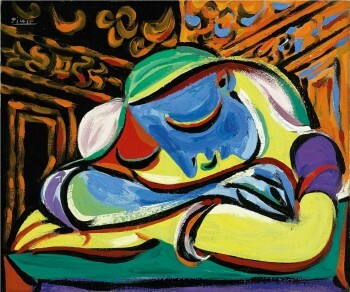 Picasso's Jeune femme endormie at Christie's. (click on image to enlarge) UPDATE: IT MADE £13,481,250. A rarely seen masterpiece by Pablo Picasso (1881-1973) will feature at Christie’s sale of Impressionist and Modern Art in London in June. Jeune fille endormie, 1935, is an intimate portrait of the artist’s lover Marie-Thérèse Walter, the subject many of Picasso’s most celebrated pictures, and is expected to make £9 million to £12 million. The painting was given to the University of Sydney in 2010 by an anonymous donor on condition that it would be sold and that the University would dedicate the proceeds to scientific research. The sale takes place on the evening of June 21. 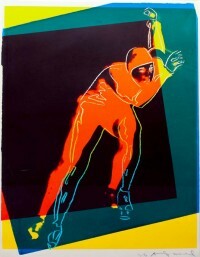 It is the first time this portrait will be offered at auction. Diamonds are Forever concept artwork (left), detail (centre) and the final poster design (right). Diamonds are Forever and posters are pretty important too. The original concept artwork for the poster campaign of the 1971 James Bond classic Diamonds Are Forever hand-painted by Robert McGinnis leads Christie’s sale of Vintage Film Posters in London on June 15. The unique prototype offers a rare chance to own an exceptional piece of James Bond memorabilia. It is estimated at £18,000-24,000. The auction spans nine decades of film making with over 300 lots of promotional material. As well as James Bond posters, Dr. No through to Never Say Never Again, a rare advance British quad for Thunderball, 1965 (£6,000-9,000), original concept artwork for View to A Kill, 1985 (£4,000-6,000), and the final poster design used for the Eon/United Artists production Diamonds are Forever (£300-500), the sale features cinematic genres from Film Noir to Disney. The selection includes Catherine Deneuve in Belle de Jour, 1967 (£300-500), Audrey Hepburn in Breakfast at Tiffany’s, 1961 (£1,500-2,500), Elizabeth Taylor in Cat on a Hot Tin Roof, 1958 (£300-500), Anita Ekberg in La Dolce Vita, 1959 (£4,000-6,000), as well as Marilyn Monroe, Brigitte Bardot, Lauren Bacall and many more. A 30 year old bottle of French brandy commemorating an English Royal wedding features at an Irish auction in May. 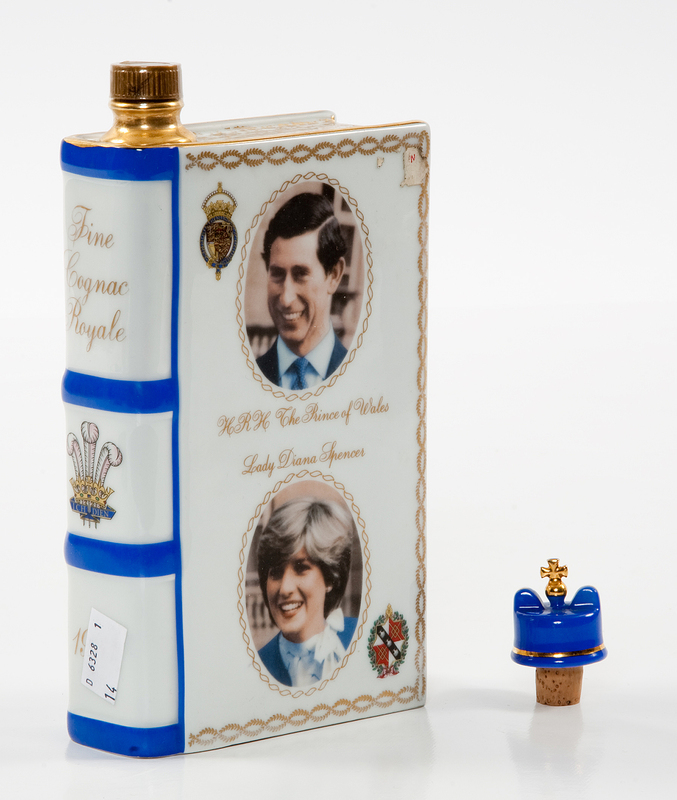 Lot 469 at Mealy’s sale of fine and decorative art at Castlecomer, Co. Kilkenny on May 4 is a Limoges container of Cognac Camus modelled as a book to commemorate the wedding of Prince Charles and Lady Diana on July 29, 1981. There are separate colour photos and drawings of the star crossed pair on the front and colour crests of the Prince and Princess of Wales on the back. This limited edition – La Grande Marque No. 602 – is estimated at 120-180 euro. The 831 lot sale features furniture, paintings, jewellery, clocks, carpets, rugs, bronzes, overmantles, porcelain and a collection whiskeys and brandies. 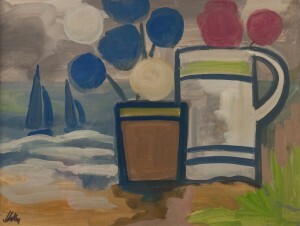 Markey Robinson (1918 - 1999) “Still Life with Jugs, or Flowers by the Sea,” at Mealy's. It is estimated at 3,000-4,000. (click on image to enlarge) UPDATE: THIS WAS UNSOLD. BRENDAN BEHAN was the inspiration for a major highlight of the most significant collection of contemporary German art of the 1960’s and 1970’s ever to come to auction. Sotheby’s offering of The Duerckheim Collection in June includes masterful works by Georg Baselitz, Gerhard Richter and Sigmar Polke. The sale in London is expected to bring in more than £33 million sterling. 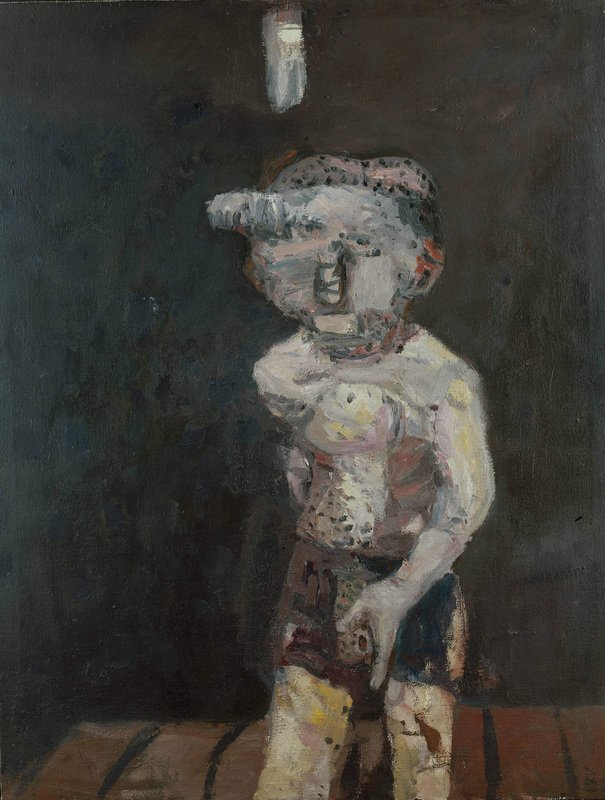 Georg Baselitz’s Die Grosse Nacht (The Big Night) from 1962-63 is the most important German work of art of the post war period to come to the market. 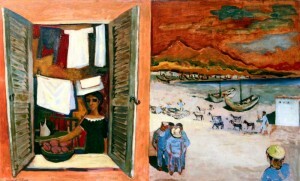 It is the first of three paintings on this theme, one of which is housed in the Museum Ludwig in Cologne while the other is one long term loan at the Van Abbe Museum in Eindhoven. When unveiled in 1963 at the artist’s first solo exhibition – the inaugural show of Michael Werner and Benjamin Katz’s gallery in West Berlin – it was confiscated by the Director of Public Prosecutions for “infringement of public morality”. The artist and gallerists were fined. 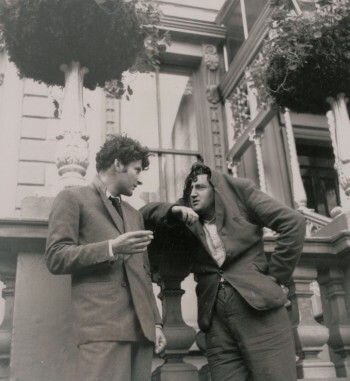 The work was inspired by a newspaper article about the Irish poet, Brendan Behan, who gave a reading of his poetry drunk on stage with his trouser flies open. For the artist the work represents the ultimate provocation, which he considers the ultimate and inevitable purpose of his painting. 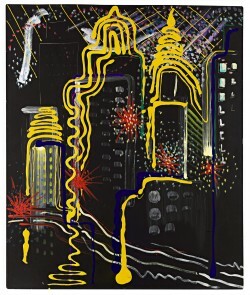 Georg Baselitz has stated that perhaps he never has and never will make a finer painting than The Big Night Down the Drain. The work is estimated at £2-3 million. 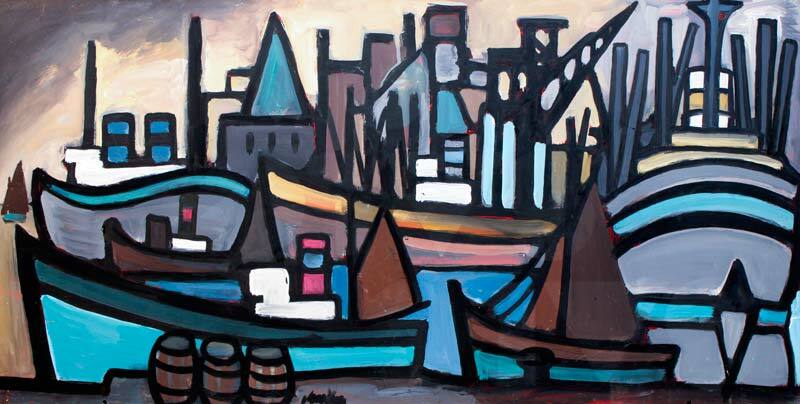 The 59 artworks in the Duerckheim Collection have not appeared on the market for over 30 years. They will be offered at Contemporary Art evening and day auctions on June 29 and June 30. The works include early photo paintings by Gerhard Richter and rare early works by Sigmar Polke, Blinky Palermo, Konrad Lueg, Jörg Immendorff and Eugen Schönebeck. UPDATE: New artist records were established for Blinky Palermo, Sigmar Polke, Eugen Schönebeck, Markus Lüpertz and Georg Baselitz. 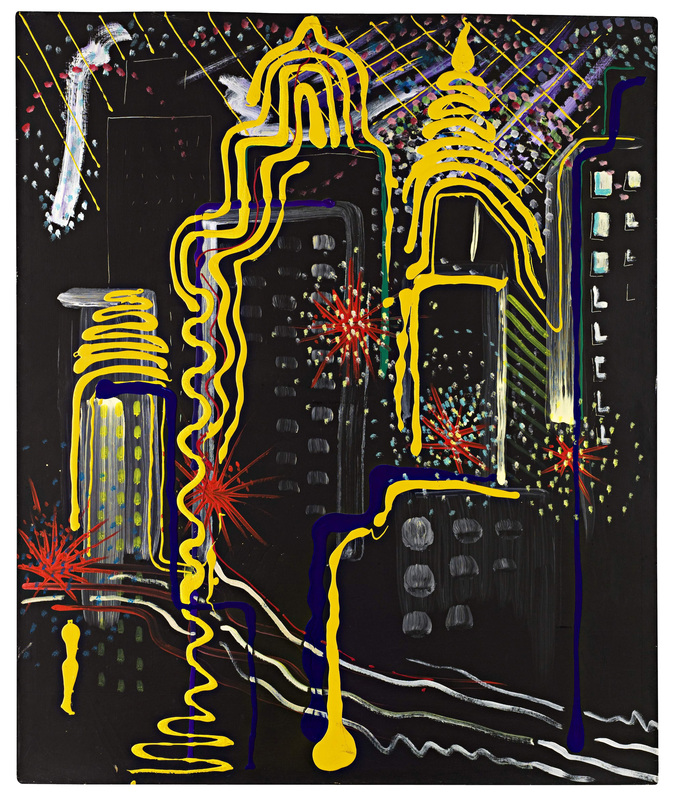 The Duerckheim Collection of contemporary German art, which comprised the first 34 lots, realised £60,401,650. 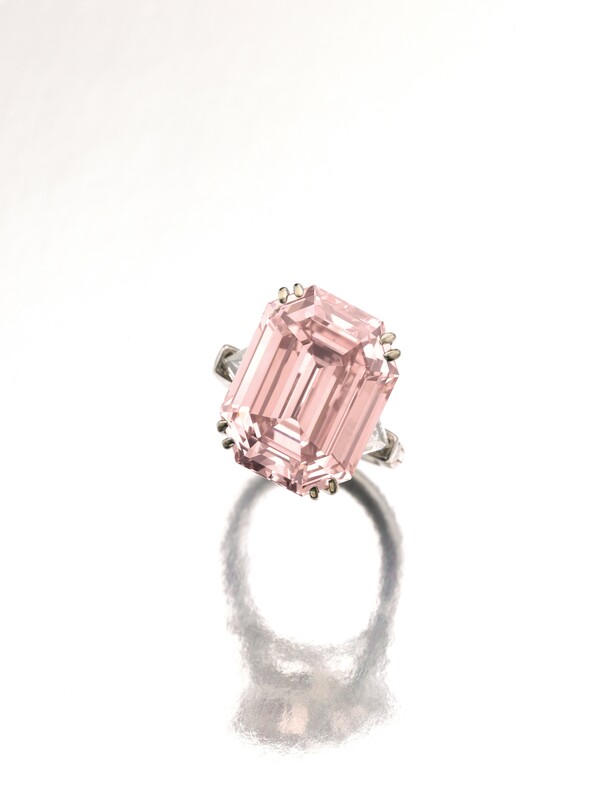 Rare emerald cut pink diamond at Sotheby's. (Click on image to enlarge). A pink diamond weighing 10.99 carats will be offered by Sotheby’s at its sale of magnificent and noble jewels in Geneva on May 17. Graded as “fancy intense pink” it is part of a rare subgroup of diamonds known as type IIa and comprising less than 2% of all of the world’s gem diamonds. Stones in this group are chemically the purest of all diamond crystals. This stone features a classic emerald cut, a style of cutting normally associated with white diamonds. It is immensely sought-after when found in the rare colours such as pink and blue. Estimated at CHF 8.3-14.8 million ($9-16 million), this stone is being offered for sale from a private collection and has not appeared on the market for more than 30 years. UPDATE: International jewellers Leviev outbid four underbidders to purchase the 10.99 carat diamond for CHF 9,602,500/$10,840,358, the third highest price for a pink diamond. It was the ninth highest price for a diamond at auction. The throne chair from the convent auction. UPDATE: IT MADE 900. 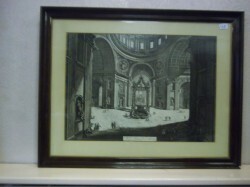 One of the four Piranesi prints. (click on image to enlarge) UPDATE: THE SET OF FOUR SOLD FOR 500. In Ireland in the 1990’s and a little bit beyond sales of contents from former monasteries and convents were a regular feature on the auction scene. Such sales are more rare nowadays. So there is bound to be interest in a single sale from three convents on Sunday May 1. The auction features objects from the Convents of Mercy in Cobh, Co. Cork and Enniscorthy, Co. Wexford as well as from St. Marie’s of the Isle in Cork city. It will be held at St. Marie’s of the Isle in Cork city centre and will be conducted by P.J. O’Gorman auctioneer of Charleville, Co. Cork. 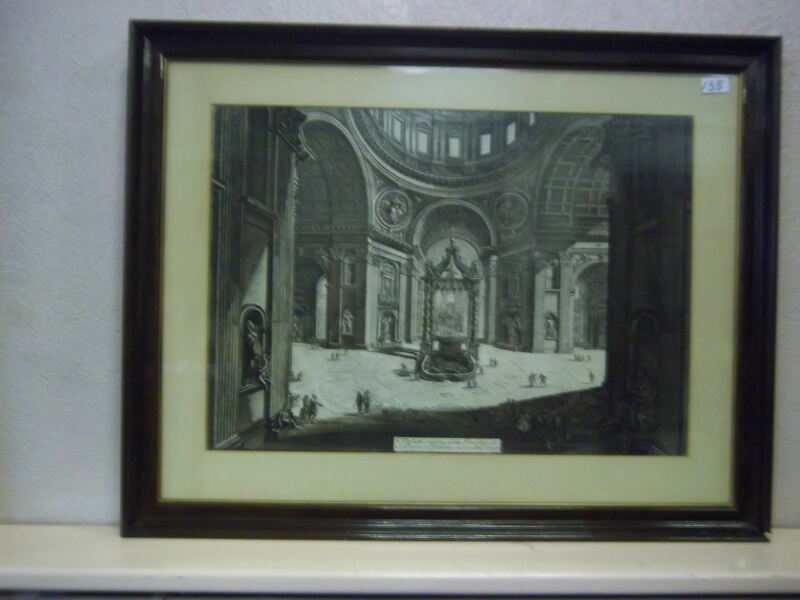 It features a set of four large prints of Rome by Giovanni Battista Piranesi framed by the old Cork concern of Guy and Company. 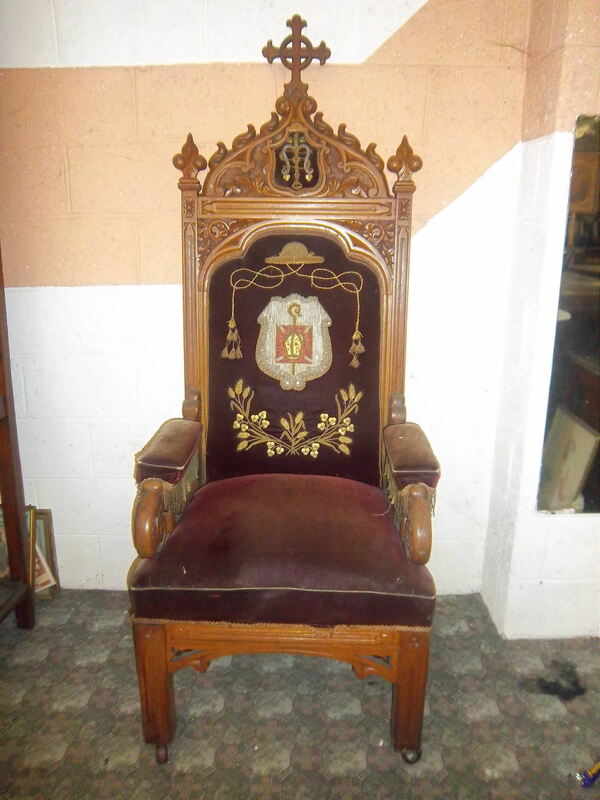 There are library bookcases, Victorian and Regency dining tables, antique breakfast tables, a mahogany longcase clock by Mangan’s of Cork, a carved throne chair, display cabinets, a seven piece inlaid drawingroom suite, kneehole desks, four pianos, church pews, statues, brass and china among 416 lots. UPDATE: The auction was almost a complete sellout with all but three lots finding buyers. 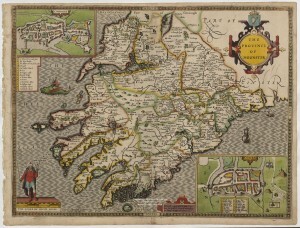 The production of this atlas in 1611 was the first time that plans of counties and towns became available in print. A major innovation it was an immediate success. It was the first time that at least 50 of the 73 towns included were mapped. 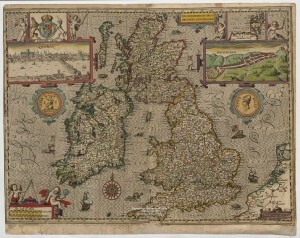 There is a single sheet for for each county of England and Wales, a map of Scotland and each of the four Irish provinces. 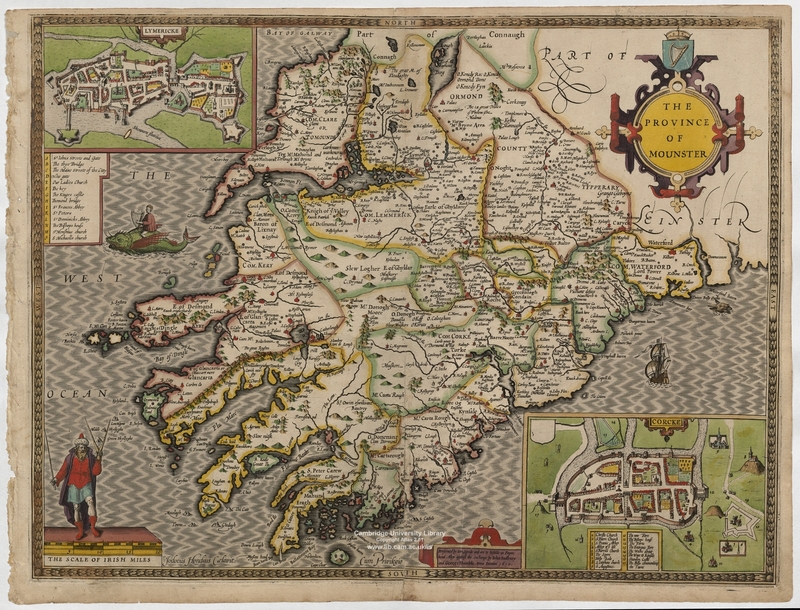 The map of ‘Mounster’ (Munster) identifies ‘Lymerick’ and Cork as the two biggest cities. The extensive coastline is emphasised by ships and green fish-like creatures emerging from the sea. Cambridge acquired the proofs in 1968 after the British government refused an export licence. By 1627 the atlas cost 40 shillings. 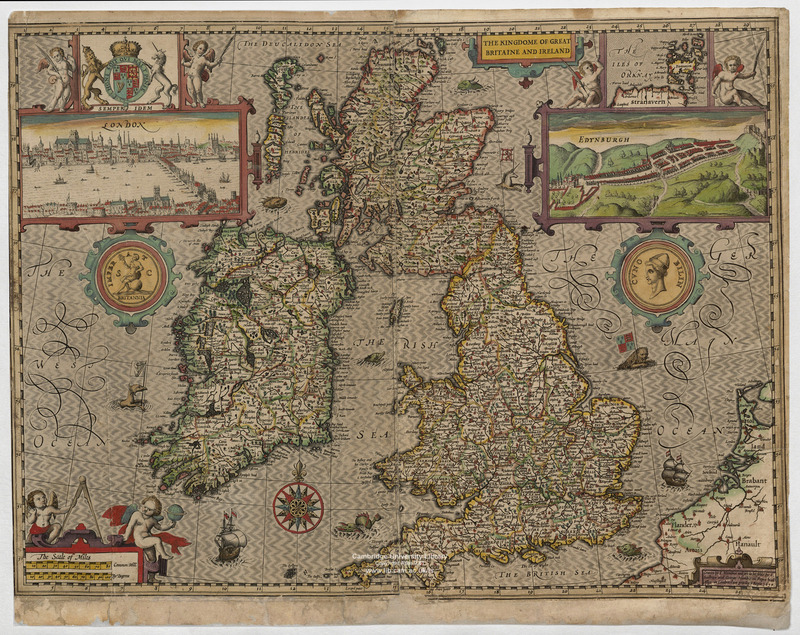 Born in Farndon, Cheshire in 1551 or 1552, John Speed was an historian as well as a cartographer. He paid tribute to earlier map-makers whose work he drew on, especially the county maps of Elizabethan surveyor Christopher Saxton. Speed wrote: “I have put my sickle into other mens corne”.